We know the area today along Route 15 South and across from the Lakeside Shopping Center as Fireman’s Field and Lakeside Recreation Complex, parts of Jefferson Township’s Recreation Department. However, earlier in Lake Hopatcong’s history this land was cleared for a very different purpose – one which caused much anticipation and excitement – the building of Lake Hopatcong’s very own airport. After Charles Lindbergh’s successful crossing of the Atlantic in 1927, America witnessed a boom in the construction of airports and airfields. 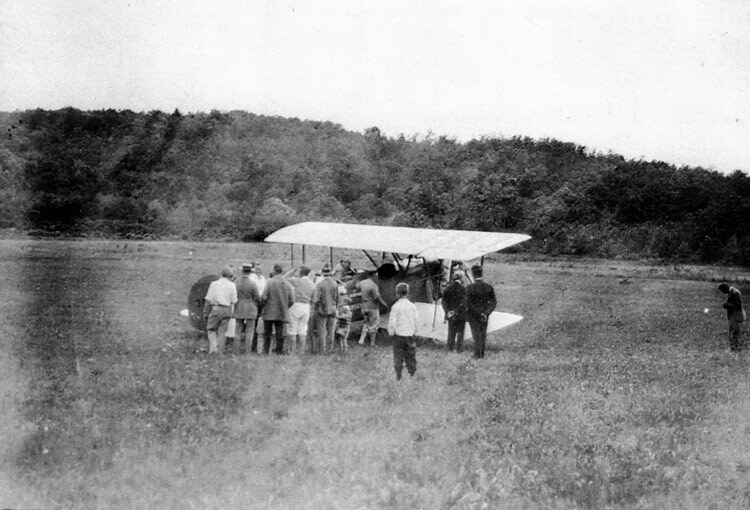 As the Lake Hopatcong Breeze explained in its July 7, 1928 editorial, “Colonel Lindbergh in his recent tour of the country could not express too emphatically his opinion that the crying need of every community is an adequate airport.” These early facilities were not much more than grass fields established to accommodate the small planes that were starting to become popular. The Breeze opined that “this mode of travel will soon be as common as the automobile and motorboat.” Indeed, during this period many considered airplanes to be the next logical private means of transportation that individuals would own. The expectation was that a significant number of people would soon wish to own their own aircraft and that any forward thinking community needed an airfield to accommodate future visitors. 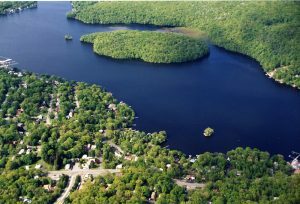 Therefore, if Lake Hopatcong was to keep pace as a popular resort it would need an airport near its hilly shores. Lake Hopatcong’s airport started like many others around the country with the clearing of a large area of flat land which could be made suitable for the take-off and landing of airplanes of the day. The June 30, 1928 Lake Hopatcong Breeze reported that, “Lake Hopatcong, not to be outdone by other far-sighted communities, will soon have a full-fledged airport. A large field situated near Tierney’s Corners, belonging to the Consumers’ Coal and Ice Company, is being leveled off and graded to form a modern landing place for aircraft.” The airport was the idea of Jerome Brady, principal of Consumers’ Coal and Ice, which owned much land (and several ice houses) around the northern part of the Lake Hopatcong. Brady owned a plane and was the first to land at his new airport. The Breeze reported that he planned to commute regularly between the lake and the company’s offices in Bayonne “as soon as he can get an official pilot’s license.” At the time, the construction of hangars was also planned. Although the airfield at Lake Hopatcong began with great fanfare, like most other early ones it was not destined to become a real airport. One might say that the concept of flying to Lake Hopatcong never quite “took off.” Instead of widespread individual ownership of small airplanes with people using aircraft instead of cars, the airline industry evolved differently. As the 1930s wore on, Brady Field was utilized more for baseball than for flying. Though there was some talk of revitalizing the local airstrip after the end of World War II, this never occurred. However, another business located in front of the airport would become quite popular. Built in the early years of the 19th century on what was then known as Union Turnpike, the Seward Inn had been one of the earliest hotels in the area but had not seen active use for almost 20 years when returning Army veteran Joseph Zidek acquired the business and in 1945 reopened it as the Airport Inn. Operating as a restaurant and tavern on what was then known as Route 6A, the Airport Inn would remain popular for the next decade. It featured an airplane motif and offered homemade specialties, dancing, and catering. The Airport Inn was very active in sponsoring baseball and softball teams, which played behind the restaurant on what had once been Brady Field. 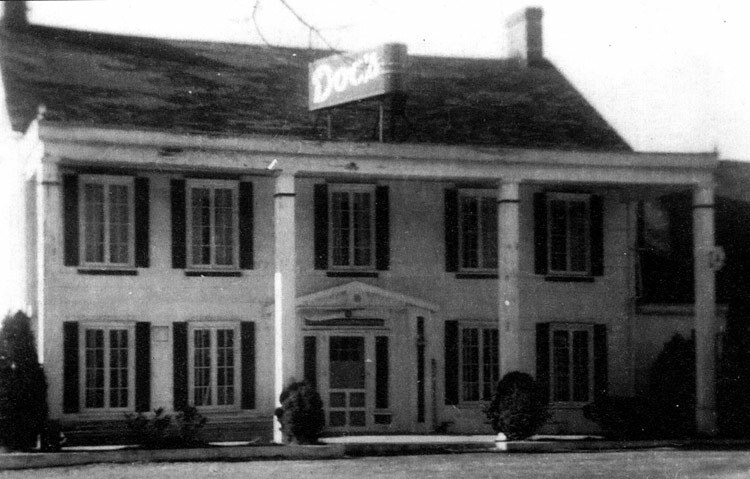 In the late 1950s, the establishment became Doc’s and in more recent years hosted the Fish and Booze restaurant and bar. Today, what was once Lake Hopatcong’s airport is actively used by Jefferson Township teams, providing thrills of a different sort.